A slot machine (in the United States), poker machine (in Australia), and fruit machine (in Great Britain) is a casino gambling device that has 3 or more reels that begin to spin when you pull the lever or press the button. The first coin machine was invented by San Francisco mechanic Charles Fey in 1895. He made up a device with 3 spinning reels that contained 5 symbols in total: diamonds, hearts, horseshoes, spades and a Liberty Bell (actually the machine was named in honor of the Liberty Bell - a symbol of American Independence). A set of three matching symbols brought to victory; some symbols were more valuable, others less. This machine has automated build-in payout system. Liberty Bell was a great breakthrough in gambling industry. Thus, five symbols replaced ten cards and the game seemed much easier requiring no special experience or knowledge and looked very attractive at a first sight. When American government abolished gambling in many states Fey introduced new device that contained fruits and candies instead of symbols. This kind of machine was named "Fruit Machine." Liberty bell was extremely popular so it was copied by great amount of manufacturers. Thus on 1907 Herbert Mills (Chicago) produced a device and named it Operator Bell. By 1908 saloons, barber sores, small sores and other places were installed with coin machines and brought great deal of profit to their owners. In 1960s slots became more advanced and reliable. It contained additional features like automated coin hoppers for simpler payouts and loud electric bells that let the casino stuff know that someone just hit the jackpot. Very soon electric devices powered by electric microprocessors replaced the old version of slot machines. They gave opportunities of larger bets and greater winnings. Gambling games progress brought to introduction of RNG (random number generator) made a revolution in the history of slot machines. It utilized programmed data that instantly sorted the numbers. Another keystone in the evolution of slots is its online version in the World Wide Web. Slot machines are played by enormous quantity of players all over the world. Experienced players value their simplicity and newbies are fond of colors and absence of the necessary sophisticated skills for gaming. 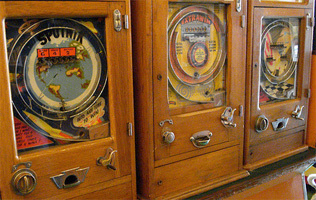 By analogy with the lever on the side panel of the machine and their ability to empty players' wallets this device was also often called one-armed bandit. Slots are the most beloved gambling alternative which the world gambling history has ever seen as they bring nearly 70% of all casinos income. Every slot machine has a currency detector that identifies a piece of currency inserted. All up-to-date machines are equipped with RNG (random number generators) that eliminates the repeat of number sequence. Native American gambling houses, situated in reservations, are not allowed to use slots unless they settle special pact with the authorities of the state where casino is located. How do you identify that online casino is reliable?